Custom Laser Cutting & Engraving for Jewellery Makers & Designers. Based in Australia. Buy our material sheets at My Little Acrylic Shop. Our range boasts 300+ varieties, all selected and offered based on their suitability to laser cutting and engraving. We keep all of these in stock, so they are ready for you! This pattern can be engraved onto any of our designs. To order, simply navigate to your shape of choice, click into the listing, and select the option to add a pattern engrave. Follow the prompts to checkout and your pieces will be laser engraved and cut to order. Scroll down for sample photos. Pattern placement varies, so each laser cut shape will have a slightly different area of the pattern on it. 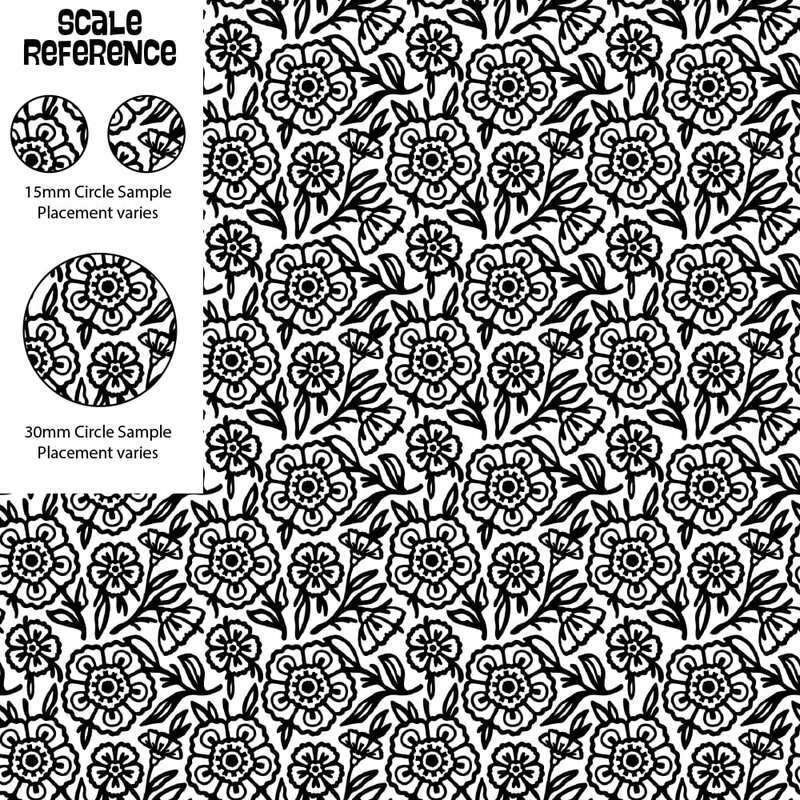 Pattern scale is set at the size shown (circles in image show scale reference). Sizing Tip: Add pattern engrave onto pieces around 15mm or larger. This will ensure that there is enough space for a decent amount of the pattern to fit. Pattern is multi-directional (looks similar if reflected or when viewed from all different angles). Looks stunning on mirror acrylic and any type/colour that shows high contrast when engraved. Material Tip: For best results, use pattern engrave on simple shapes, with simple materials. For example, leopard print engraved onto a matte black acrylic circle is stunning! But a pattern engraved onto a detailed silhouette in something like Kaleidoscope Chunky Glitter Acrylic will look too busy. Engraved areas can be paint filled to add colour and variety. See our tutorials for a step-by-step guide and tips for paint fill technique. Sample of laser cut pieces with pattern engrave added. Some have paint fill technique applied to add colour. 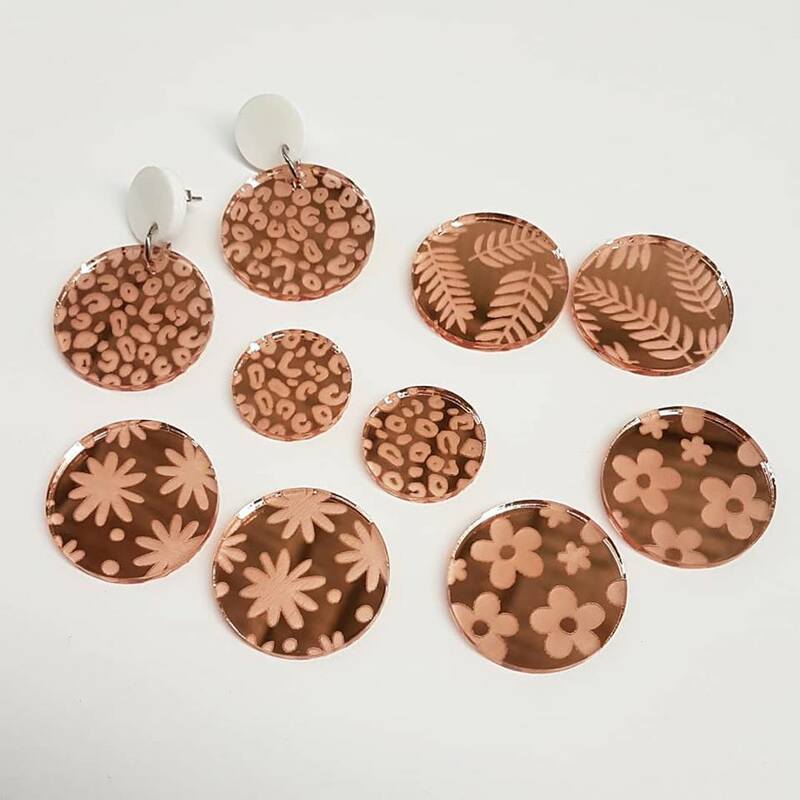 Sample of Rose Gold Mirror Acrylic laser cut pieces with pattern engrave added. This entry was posted in Engraved, Pattern Engrave, Uncategorized. Bookmark the permalink.  Copyright 2019 © Team Vector Etch Pty Ltd.